If now is not the moment to rebuild, when is? Are you proud of New York’s John F. Kennedy Airport? It’s a question I ask nearly every audience I speak to these days. JFK, after all, is the largest entry point for foreign visitors arriving in what sees itself as the greatest city on earth. Yet the unemployment rate for construction workers in the United States is in the double digits. And the government can borrow — in the currency we print — at long-term rates of less than 3 percent. If now is not the moment to rebuild these airports, when will that moment ever come? The American economy is not performing to the satisfaction of the American people. Total incomes are about $1.5 trillion less today — or $5,000 per person — than was anticipated in 2007 before the financial crisis began. The share of American adults working has increased only slightly since the recesssion’s trough, and more than 5 million fewer people are working than when employment was at peak levels in the mid-2000s. Median family incomes and hourly wages have remained essentially stagnant for more than a generation. The single most important step the US government can take to reverse these discouraging trends is to mount a concerted, large-scale program directed at renewing our national infrastructure. At a time of unprecedented low interest rates and long-term unemployment, such a program is good economics but, more fundamentally, it is common sense. Few Americans are impervious to the crumbling infrastructure in their everyday lives. The country that brought the world the Internet and continues to lead the globe in information technology has an air traffic control system that relies on vacuum tubes and where sticky pieces of paper are moved around on bulletin boards to track flights. Even leaving aside the safety risks, the costs in extra fuel consumption and unneeded delays are measured well into the tens of billions of dollars. Can it possibly make sense to wait until every repair person capable of working with vacuum tubes has died off to complete the renovation of this antiquated system? I travel constantly. Calls to my office on my iPhone are less likely to drop driving from Beijing to its airport or from Almaty in Kazakhstan to its airport than driving from the airport into Boston, New York, or Washington. I know I’m not alone in experiencing such problems. Surely, at a time when US companies are holding close to $2 trillion in cash, earning next to nothing for balance sheets, we should be investing in improving this frustrating deficiency. As secretary of the Treasury during the Clinton administration, I used to visit a public school every time I went to a city outside Washington. I’ll never forget an occasion at an Oakland high school when I gave a speech extolling the importance of education. A young teacher came up to me and said, “Secretary Summers, that was a fine speech, and I agree with all of it. Just one thing — why should any of the students believe you when there is paint chipping off the walls of their classroom and when the first lunch period has to begin at 9:45 a.m. because this school is so overcrowded? There is no chipping paint at any bank. Maybe we think that is the most important thing.” She had a point I’ve never forgotten. After 40 years of dangerous energy dependence, it is possible that within this decade the United States will become a major oil and natural gas exporter. Already, we produce more oil than Saudi Arabia. And there’s no denying that having America as the ultimate balancer in the world’s oil market will make it safer and more stable than the one we live in now. But that will not happen if we, as a nation, keep underinvesting in infrastructure to the point where trains and trucks — rather than pipelines — must play the primary role in moving energy resources around our country. The terrible winter we’ve just suffered has no doubt left behind a legacy of potholes. The American Society of Civil Engineers estimates that driving on roads in need of repair costs the average Massachusetts motorist $313 annually. This is the equivalent of more than 50 cents a gallon. And yet gasoline taxes have not been raised in two decades, and as a country, we do not invest enough to maintain a transportation infrastructure, let alone to improve it. There are many more examples. But beyond the power of examples, there is the reality that a substantial step-up in infrastructure investment would serve all of our major economic objectives. It is as close to a free lunch as economics will ever produce. There is increasing concern that we may be in an era of secular stagnation in which there is insufficient investment demand to absorb all the financial savings done by households and corporations, even with interest rates so low as to risk financial bubbles. Raising demand through greater infrastructure investment is an antidote for such malaise as well as a source of better employment and economic growth. Why? Investing in infrastructure offers the prospect of expanded economic capacity. With interest rates already near zero, incremental private outlays brought on by easier financial conditions are unlikely to have a very high return. On the other hand, the available evidence from the historical experience of the United States, in addition to cross-country comparisons and comparisons across US states, is that the social return to public infrastructure investment is very high. We live in an ever more interdependent and competitive world. Savings can flow into any country. The fruits of research and development flow globally. Many iconic American companies now earn less than half their profits in the United States. But one thing that is inherently immobile is our infrastructure. When we put money into strengthening our infrastructure, essentially all of what we spend stays in the United States. Once in place, all the benefits of the infrastructure go to Americans. As an economic strategy, infrastructure investment also promotes fairness. The group in our society that has suffered most heavily from all of the structural change of the last generation is men with limited education. These men disproportionately work in construction, the core of infrastructure, and thus become the main beneficiaries of increased funding. Moreover, it is the majority of Americans, not the super-fortunate minority, who primarily benefit from improving public schools or airports or reducing potholes. Finally, infrastructure investment is important for generational fairness. We live in a period when a — if not the — focus of economic policy has been on reducing government deficits and debts. These are important concerns, but they have been viewed too narrowly. Infrastructure investments, even if not immediately paid for with new revenue sources, can easily contribute to reductions in long-term debt-to-income ratios because they spur economic growth, raise long-run capacity, and reduce the obligations of future generations. It is an accounting convention, not an economic reality, that borrowing money shows up as a debt, but deferring maintenance that will inevitably have to be done at some point does not. When maintenance or necessary investment is deferred, the bills climb much more quickly than the cost of federal borrowing at an average interest rate below 2 percent. Where do we go from here? This should not be a partisan issue. Democrats are correct that we need to commit more government money to measures like repairing highways and modernizing schools where there is no immediate cost recovery available. They are also right in their emphasis that a great nation cannot endure with its government operating on a shoestring. Even if we assume that entitlements are reformed, the rising share of the elderly in the population, health care costs that grow faster than the rest of the economy, and American international obligations mean that revenue increases are required if the United States is to invest adequately in its future. Republicans are right that regulatory barriers hold back infrastructure investment. We need protections, but we need them to be administered more predictably and more rapidly. In 1903, it took Harvard less than 18 months to build Soldiers Field. Less than 18 months from when the stadium was conceived to when the first game was played — even without the benefit of modern construction equipment. It would take a decade today. In San Francisco, repairs to the Bay Bridge recently took nearly four times as long as building the original bridge in the 1930s. And then there are the points that everyone should be able to agree on. Government needs to operate more efficiently. The Anderson Bridge connecting Cambridge and Boston has been under repair for nearly two years. I suspect that, with the right incentives, what was necessary could have been done in a matter of weeks rather than years. No doubt an important part of operating more efficiently will involve greater reliance on the private sector, but this must be done in a way that carefully protects taxpayer interests. For all our problems, I would far prefer play the economic hand of the United States than that of any other major country. And while much more could be said with respect to tactics, I am confident that we as a nation will get them right if we can get behind the right basic principle: From the intercontinental railway to the interstate highway system to the Internet, American economic progress has depended on fundamental infrastructure investments. Our generation has not been doing its part. It is time for us to step up. 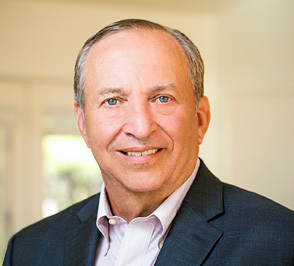 Lawrence H. Summers is a university professor and president emeritus at Harvard. He served as the secretary of the Treasury for President Clinton and the director of the National Economic Council for President Obama.